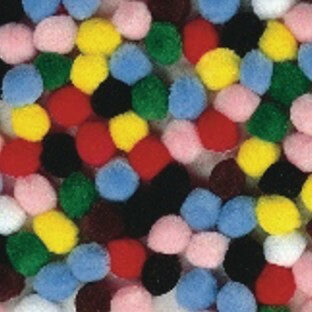 Pom Poms, 1/2" in assorted colors, pack of 100. The bag is smaller than I thought it would be but the children still enjoyed them. I've used these Pom-poms for several different crafts for adornments on a gmome's hat a nose for a reindeer and buttons for a jacket. They're very versatile. I've ordered them in different sizes and will order them again in the future. Love them!! kids love pom poms good price good selection for the number you get. I was pleasantly surprised at the high quality of these pom poms. They are very dense which makes them easier to use in crafts with glue. My daughter couldn't wait to break open the bag get started!